Gili Trawangan, one of the Gili islands, is a popular side trip from Bali for backpackers seeking scuba diving, beaches and parties. Its laid-back vibe is so captivating, you may come for a few days and end up staying for a fortnight. 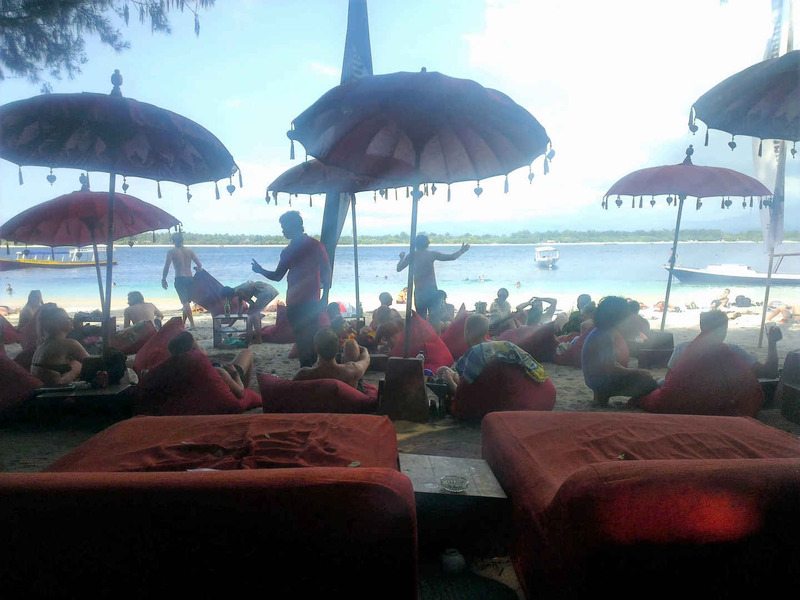 Here are the best backpackers Gili Trawangan travel tips. Boats arrive and depart from Trawangan on a regular basis. The Gili islands lie 45 minutes in a fast boat from Amed on the north coast of Bali, or trips can be booked to pick you up from your hostel or guest house in Ubud or Seminyak to the harbour at Padang Bai in the east, followed by a 1.5 hour boat journey. The main port area has an attractive white sand beach. 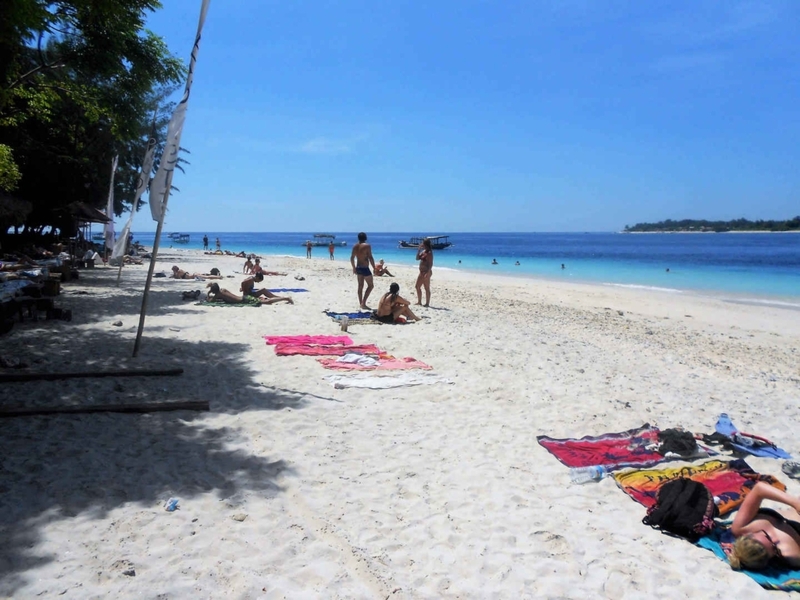 These days, long boats fight for space along this strip, as an increasing number of backpackers are drawn to Gili Trawangan, known as Gili T for short. If you have a return ticket, be sure to keep all parts of your tickets and make a note of the boat company named on it. Visit the company’s ticket office at least two days before you depart Gili T, to make sure you have a seat on your preferred date, as they get booked up quickly. Your options for backpacker Gili Trawangan accommodation are either to book in advance (check out Booking.com here) or to find something when you get there, which may mean hauling your bags around. 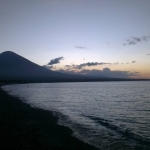 Luckily there are plenty of guest houses, homestays and backpackers hostels on Gili Trawangan. A word of advice is to choose accommodation a good distance from the island’s mosque, if you are concerned that the daily calls to prayer might disturb you – the first is at 5am. Though you may already be awake after one of the island’s legendary parties of course! If you want total bliss, pick a guest house closer to one of the island’s other beaches and the lush, high end honeymooner resorts. We stayed in Rose Homestay, a small guest house just off the main strip, which was very pleasant. The brand new building benefited from air conditioning, free WiFi, tasty breakfast served on a terrace by a friendly manager. 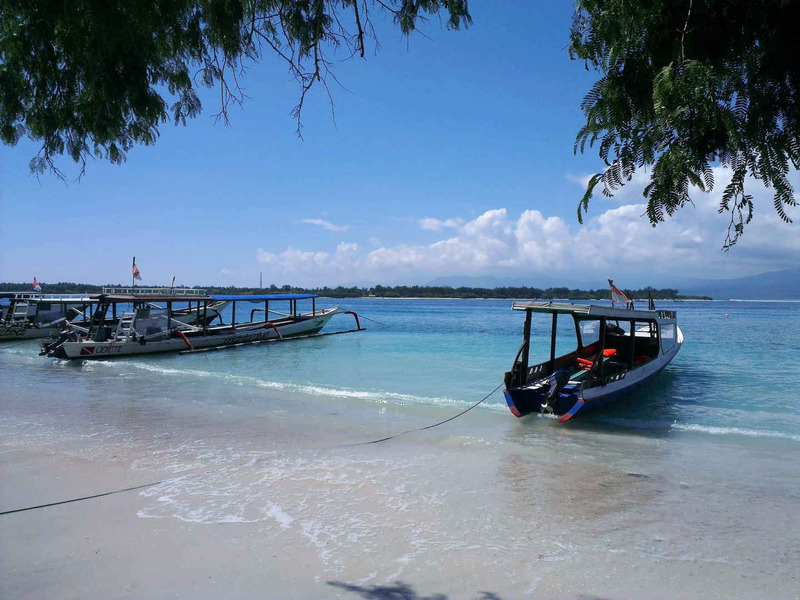 You can do as little as you like on Gili T. But if you fancy an activity, the boat owners by the port offer a range of snorkelling and diving trips, or taxi boats to the sister islands of Gili Meno and Gili Air. There are also a number of scuba diving schools here you can try if you’re on a Gili islands backpacking trip. 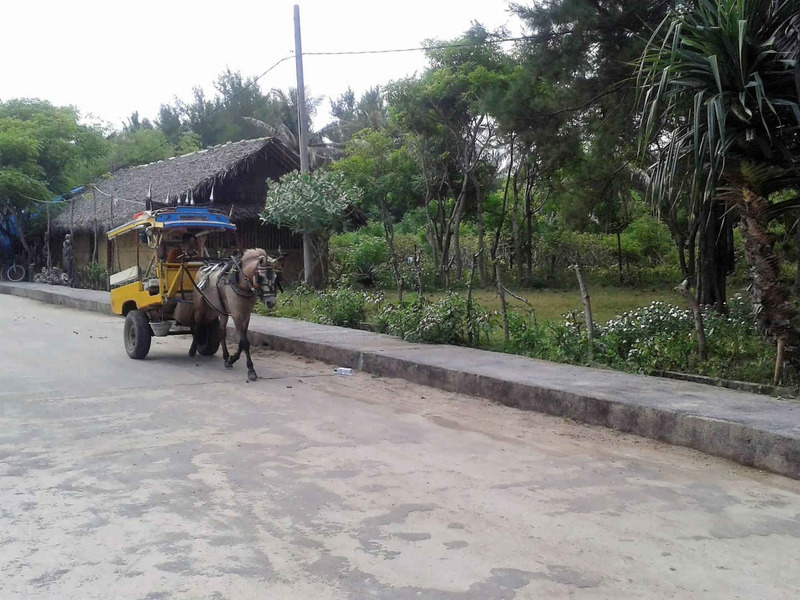 One of the things that’s most charming about Gili T is the island’s lack of motorised transport. No rattling motorbike engines here or polluting cars, just bicycles and horse-drawn carts roam the streets. The island takes an hour or two to stroll around and it’s a beautiful walk. Just a few minutes north of the main port with its bustling bars you can find quiet and peaceful beaches, with no boats. 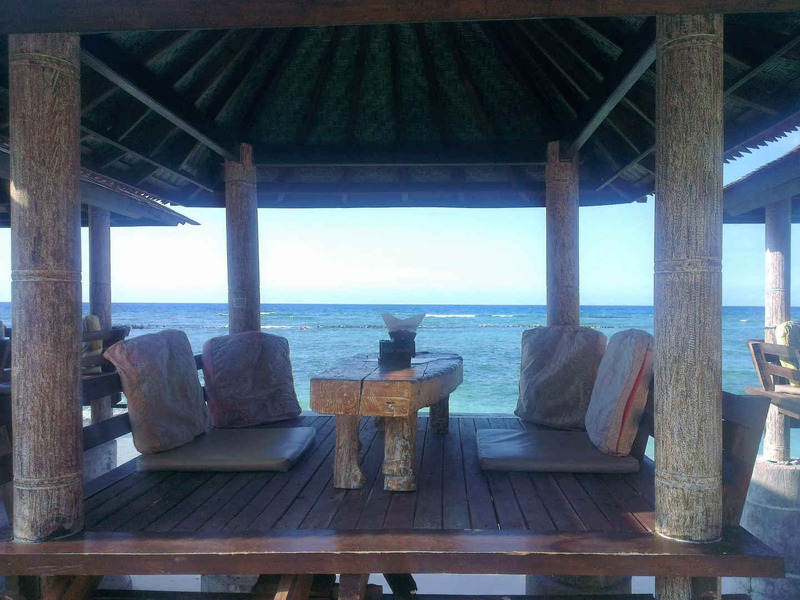 Why not grab a refreshing drink in one of the serene little wooden bars on stilts overlooking the sea. 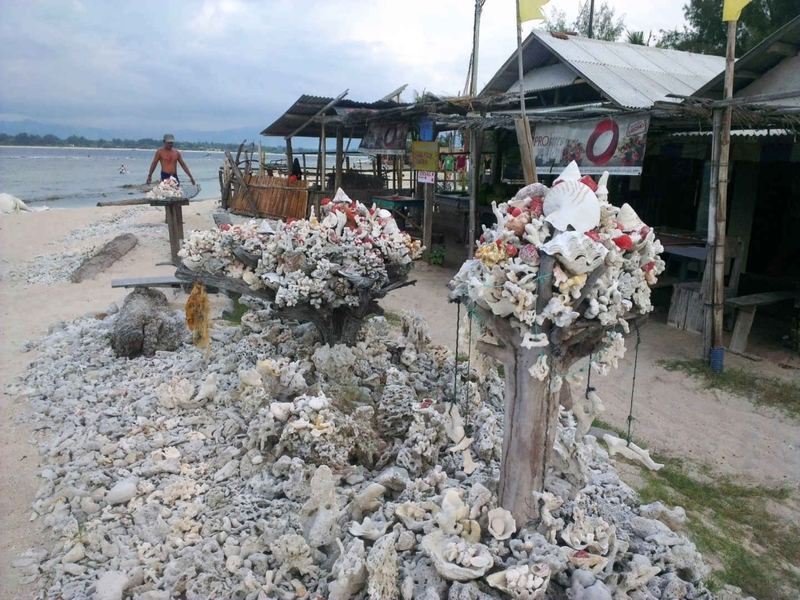 Around the island you may find quirky sculptures, like this coral garden. On the other side of the island from the port there is a romantic swing in the sea, perfect for looking wistful and forlorn as your legs dangle in the water. Though this means it’s actually quite hard to swing on it unless you stand up! If you’re keen to go off the beaten track, you can head into the centre of the island and see day-to-day life of the locals in the village streets, away from the tourist hustle. Snorkelling is a popular pastime on Gili T. Hiring a mask and fins for the day, you can swim among an array of colourful fish, coral and even a turtle or two. 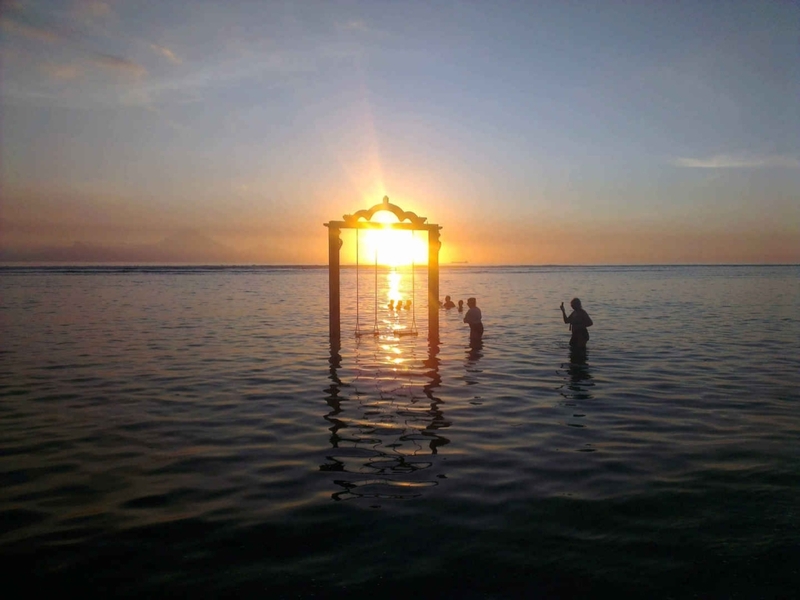 If you stick around until evening, you can witness stunning sunsets over the sea. For the ultimate in romance, sunset beach horse-riding is also available. Once you’ve worked up an appetite with an island stroll, it’s time to choose one of the many restaurants for dinner. For a cheaper option, you can check out the night market which sells traditional Indonesian street food dishes, such as nasi goreng (fried rice), sate ayam (chicken satay sticks) and curries. For after dinner entertainment, we enjoyed the reggae bar Sama Sama, which has a live band performing every evening and a friendly atmosphere, as well as beach bars such as Surf Bar. 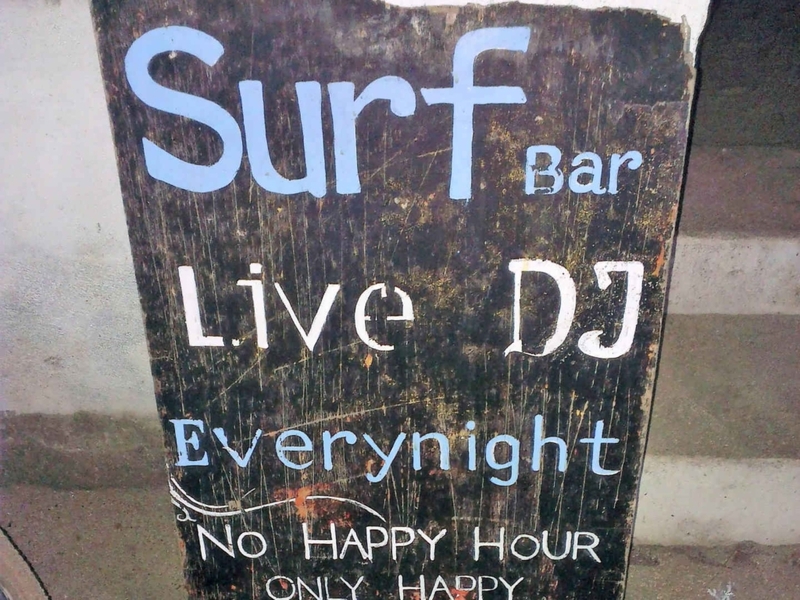 Every other night, one of the island’s bars hosts a late night party. For our last evening on Gili T, we thought it would be an excellent idea to go to the Full Moon party and dance until the early hours of the morning. Of course, it was brilliant fun. The DJs played pumping tunes and fire dancers appeared as if from nowhere. It seemed like everyone on the island was there, locals and tourists alike, spilling onto the beach. The sun was peeking over the horizon as we left. But we suffered the consequences. We had to lug our heavy bags and wait what seemed like hours for our boat back to Bali, after about two hours’ sleep and heavy from our hangovers. What a night! For Gili Trawangan backpackers, the island offers a harmonious balance between calm and lively, peace and party time, touristy and remote, activities and relaxation, so you can choose exactly what kind of holiday you’d like to have here. So what more is there to say? 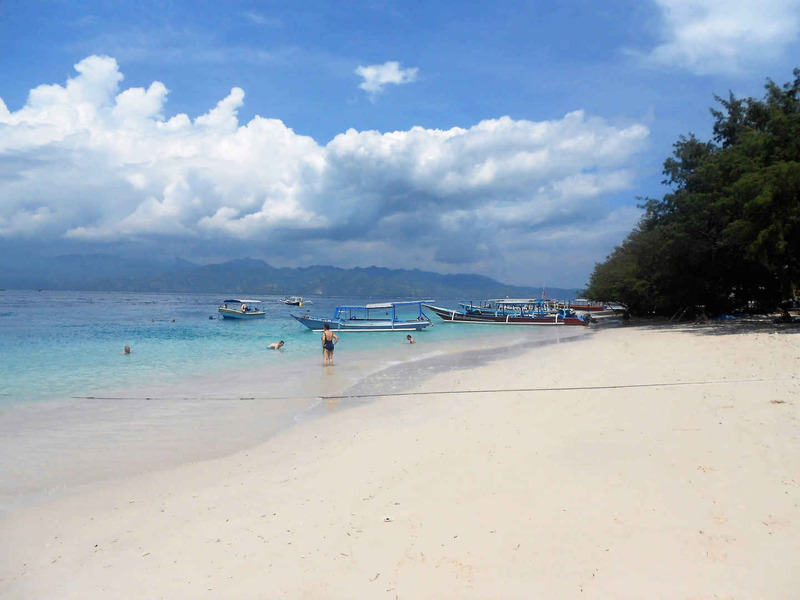 This Gili island is perfection to a T.
Now, discover my full guide to Bali backpacking here. Glad to see it’s still a great place to chill out for a while- I’m looking forward to heading out there next month! Hi, I would like to know where the romantic swing is located? Hi Sandi – it’s on the west of the island, easy to spot if you walk around along the coast. Hi Jamie – thanks! You should definitely check out the swing, it’s awesome and free for anyone to use. Walk north from the main strip, around the coast of the island and you’ll soon find it. Are you there now? Have a brilliant time!